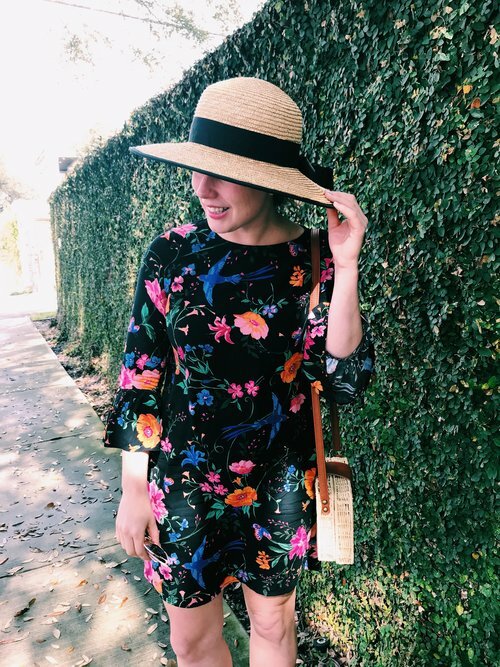 Even though half of the country is experiencing less than wanted negative temperatures right now it’s not too soon to start getting those Spring items out for the transition into blossoming days, Today' I’ve corralled five work worthy outfits for Spring. So many of the items you can already incorporate by layering a blazer and coat over for those cold weeks. I love this time of year when it’s still okay to wear a pretty warm scarf or add a pom pom beanie to a dressy work outfit. During the chilly months it’s nice on warmer days to pull out a pastel or floral dress instead of daily pants. Wearing a shoe the same color as your dress or tights makes the leg look so much longer. You can layer a top underneath the sheath or a cardigan for extra warmth. 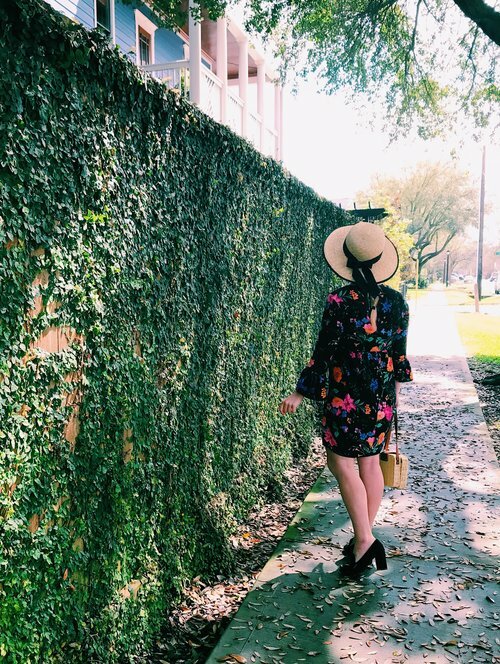 In Houston, it’s oftentimes really warm but windy during the day and cool at night so I like to just throw a trench coat over my dress and keep a sweater in my bag. You can switch out black tights for navy or even look at bolder colors like magenta worn in yesterday’s post. Also, swap out your watch band for a pale pink. I even found one for the Apple Watch here! Wear a long sleeve dark floral dress with heeled loafers for a day at work. ILook for special details like bell sleeves or an interesting neckline. You can also opt for pretty chiffon fabric that has movement when you walk. Dressing up can still feel effortless if you choose a dress with a little flair. If you think about it, a dress is just a really long shirt. I would layer a black wool trench coat and tights for a Winter flair. A pretty blue and white dress works perfectly this time of year. You can throw a warm wool trench coat over it and add a fur stole for a dressy night out. 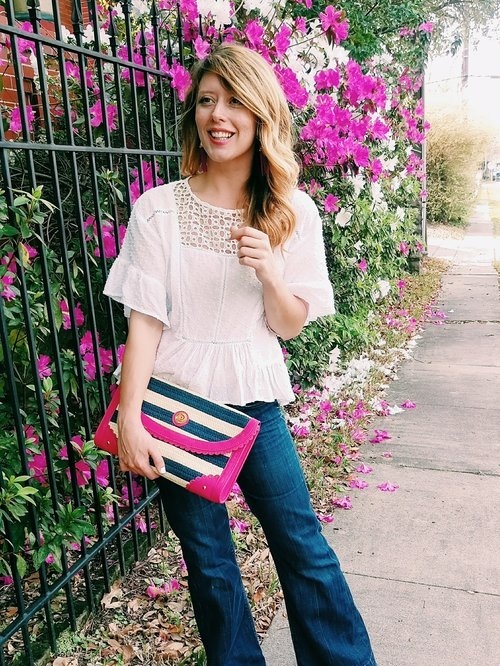 I love adding pretty blush accessories like these shoes and satchel purse. Come spring and summer you can remove the coat and just enjoy a pretty patterned dress, basket bag and sweet sandals. Casual Friday becomes super chic when you sport a pair of trouser jeans. They are my favorite! These were the first pair of jeans I spent more than $100 and I’ve had them for 12 years! I did the math and they came to about $14 a year if you factor how long I’ve had them. They are still in perfect condition! Add a peplum white top and a few bright accessories for an unexpected pop of color. This is one of the simplest outfits I own but I’ve worn it over and over until eventually I had to get rid of my tulle skirt from all of the wear and tear. You can create this outfit with whatever color scheme you have in your closet. 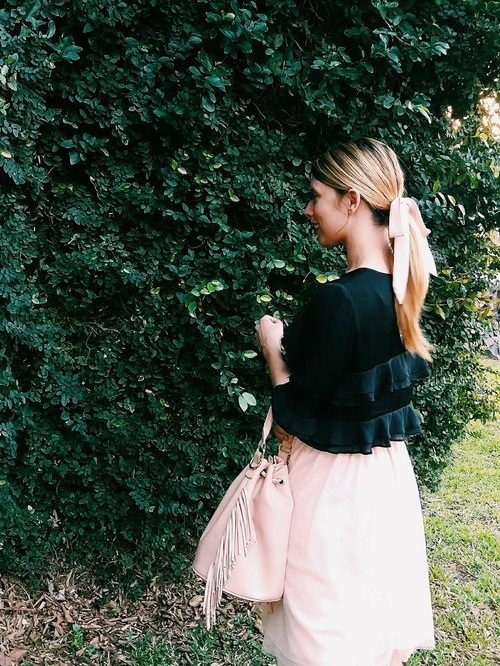 Take a feminine ruffled blouse and add a tulle midi skirt. I like to wear flats like these mary janes on work days with lots of meetings. For the finishing touch add a pretty hair bow. You can create one with a simple scarf or belt from a dress or buy one already assembled.